I'm installing a new ceiling fan. 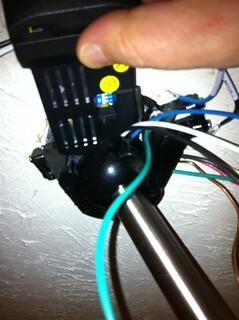 However, my ceiling pitch is so steep that the receiver won't fit into the little slot in the bracket. Well, it'll fit if I swing the downrod out but if I let go, it would crush the receiver. What are my alternatives? Does anyone know of a smaller receiver? I've heard of receivers that fit into a light switch but have never seen one. Here's a pic so you can see my problem. 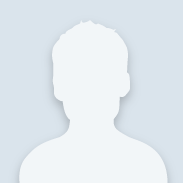 Hello Blaine and thank you for joining our How-to-Community. Blaine sometimes ,depending on the style of the fan, ceiling fan remote receiver can be installed in what we call the canopy, just above the lights below the blades, inside the housing. Can you post a picture model#/picture of your fan? I'm not aware of the smaller receiver. Did you purchase this remote separately? I am thinking you might need to replace the wall switch with a Fan/Light control. There's no way it's going below the fan blades. There's nothing but a light bowl there. And the receiver is too big to just sit inside the canopy that hugs the ceiling. There are two light switches on the wall - one for the light and one for the fan. They wires from the switches go up into the attic and are easily accessible. I think I'll just put the remote there in the attic instead of at the fan. I can easily cut tap into the wire there. Yesterday, my husband purchased 2 - Hampton Bay Windward IV ceiling fans. We had the same problem with housing the receiver ... Which is totally impossible. Hampton Bay should replace their receiver with a smaller one or else replace the smaller housing unit with a larger unit for their large receiver. We tried the close to ceiling mount and also the standard mount, but the big problem was that darn receiver. It was just too large to fit inside the small housing unit. We are upset with this and will take this back to the Home Depot for a refund. After 3 hours of installing, you would think the job of putting up 1 of the 2 ceiling fans would be finished by now. Well, what a waste of our time. BlaneJ, Please just be careful and make sure you put the reciever in a box and do not splice any wires and let them lay free in the attic. Definite fire hazard and against code. So sorry to hear about your issue but these designs have been around for years now and this is really the only times the receiver doesn't fit. Its a very good design, that's why its been around so long. This receiver will fit in any standard canopy except a steep incline of a vaulted ceiling. I am having the same problem. I have a Hampton Bay Windward IV 52 inch ceiling fan. I believe the receiver is supposed to go inside the canopy and perhaps the antenna is supposed to stick out. I think the biggest problem is the instruction do not address this issue at all. There are no pictures nor descriptions. Where the receiver box goes in not even mentioned in the instructions. These are some of the most poorly written directions I've dealt with in a long time. The receiver is just to big to go inside the canopy. If there is a trick to it, or if it's supposed to go in a certain spot, it would be nice if it were addressed in the instructions. I'm having the same problem-- Home Depot, please help! After spending several hours trying to install this ceiling fan on a vaulted ceiling, I can say with absolute certainty that the receiver simply will not fit in the space within the hanging bracket. This fan can only be installed on a flat ceiling. The installation manual states that it can be installed on a ceiling with a 30 degree pitch but this is not true. I have a 26 degree pitch and was not able to fit the receiver where it needed to go. I will return the fan to Home Depot and look for another fan.